Coach Jeff Fisher was the speaker. General manager Les Snead’s new contract was the topic. “I’m so busy here, I was honestly unaware he was extended. I’m being honest with you, we’re just working here,” Fisher said. “I look at this as being my responsibility, the win-loss record. We need to do a better job from a personnel standpoint. We’ve had some unfortunate things take place with some high picks in Stedman Bailey and Tre Mason and those kinds of things you don’t anticipate. The comments went over like neutron bomb elsewhere in the ranks of the Rams. And it revealed a problem that’s existed since well before the team arrived on the West Coast. In this week’s Game Plan, we’ll look at Carson Wentz’s recent struggles, the Patriots without Rob Gronkowski, the Giants’ free-agent class facing a major measuring-stick opportunity, a couple of Heisman finalists and the growth of burgeoning MVP candidate Matthew Stafford. The Rams have not had a winning season since Fisher and Snead joined the franchise in 2012. But we start in Los Angeles, with a deeper look into a problem that will be difficult for the Rams to fix going forward. And to be clear: What Fisher said Tuesday about the state of the team’s roster didn’t create a problem, so much as it revealed one that’s existed for quite some time. The struggling 4-8 Rams host Atlanta on Sunday, then head to Seattle before closing the season with San Francisco and Arizona at home. If the Rams split those four, they’ll match the 2014 low-water mark for Fisher’s five years at the helm. If things don’t get better over the next month, there’s no assurance the club will go forward with any of the current power brokers on the football side. And when I say “get better,” that means more than just beating the Niners or Falcons. It also means seeing the middle-school lunchroom sniping—the kind that earned the building the “Junior High” nickname—fixed to a reasonable degree. Fisher’s take about the talent on the roster provides a window into the issue dividing the Rams front office. You can infer that a certain amount of water must flow under a team’s bridge before a high-ranking executive, like Fisher, publicly pees in the company pool. 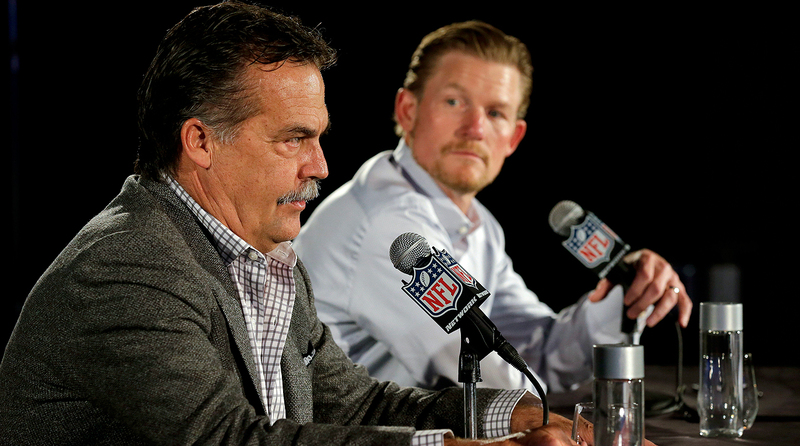 Fisher and Snead arrived as part of an arranged 2012 marriage after the Rams axed coach Steve Spagnuolo and GM Billy Devaney, and the team outdistanced the Dolphins for the coveted ex-Titans coach. Part of Fisher’s motivation for picking St. Louis was having larger say in personnel decisions, and the organization was structured to reflect that with a partnership between the coach and GM under COO Kevin Demoff. There are differing accounts of when things soured. Efforts to get comments from both Fisher and Snead were unsuccessful on Wednesday. But the problems have been an open secret in league circles for some time. Now, this isn’t exactly unusual. San Francisco had issues with Jim Harbaugh and Trent Baalke, which proved irreconcilable. The Colts had their own problems with Chuck Pagano and Ryan Grigson, and those two found a way to make peace and move forward when it seemed impossible. Way back, Giants GM George Young and coach Bill Parcells hated each other all the way to two Super Bowl titles. That said, the relationship between Fisher and Snead has been consistently described to me as “toxic.” And it’s been that way for a while. From the coaching side, the only surprise in Fisher’s comments were that they were made publicly. Internally, while most acknowledge that there’s a talented young core in place (Robert Quinn, Aaron Donald, Todd Gurley, Alec Ogletree, Trumaine Johnson), complaints about the depth of the roster and a failure to strike with draft picks outside the first round haven’t exactly been rare. They’ll also question how hard the team is pushed, with a lack of in-season padded practices being an example of the perceived problem. Then it starts to get personal. One example: Perception held that Fisher’s guy in scouting for his first four years was Rich Snead (no relation to Les), who was seen as abrasive with scouts and an operative of the coach’s. He left the Rams last winter, amid some feeling that he was a divisive force in the organization. To his credit, the GM has remained above board through this mess, at least publicly, and in the aftermath of Fisher’s comments. But clearly, there’s blame to go around when a team goes 31-44-1 in five years, without so much as a .500 season along the way. Can that be fixed by New Year’s Day? It’s become increasingly clear that it better be. 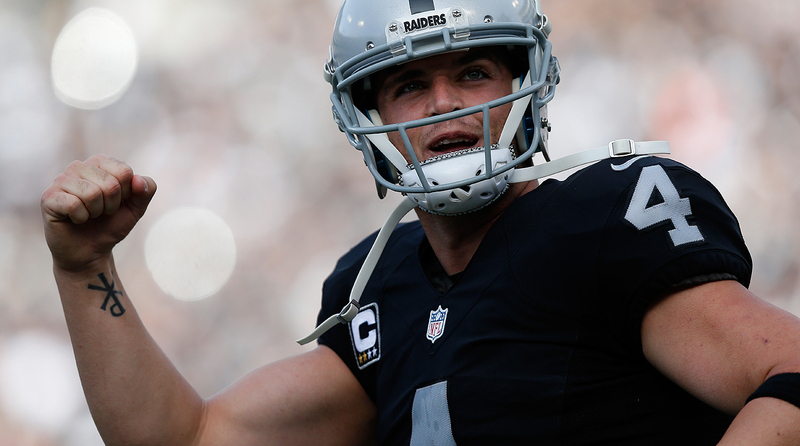 • I can’t wait to see Derek Carr play a high-stakes cold-weather game in a hostile environment and prime-time setting. We already know plenty about the Raiders quarterback. This could tell us more about Oakland’s playoff mettle. • Speaking of AFC West quarterbacks, here’s hoping Trevor Siemian gets back out there and starts in Nashville. His play was a real silver lining in Denver’s loss to Kansas City, and his continued improvement is a big storyline as we approach January. • Eagles defensive coordinator Jim Schwartz remains a hot coaching candidate, but his unit has regressed, allowing an average of 28 points the past three weeks. The explosive Redskins may not be the best team to get well against and will provide a test. • If Texans receiver DeAndre Hopkins is going to get the payday he’s seeking, this week’s showdown with Indy has to be a big-money game, especially after an uneven, drop-laden performance in Houston’s loss to Green Bay. • For seven years, we’ve heard how Earl Thomas is the engine behind Seattle’s Cover 3. The Seahawks have played one game without him over that time, and that was two weeks ago. No pressure in replacing him, Steven Terrell. 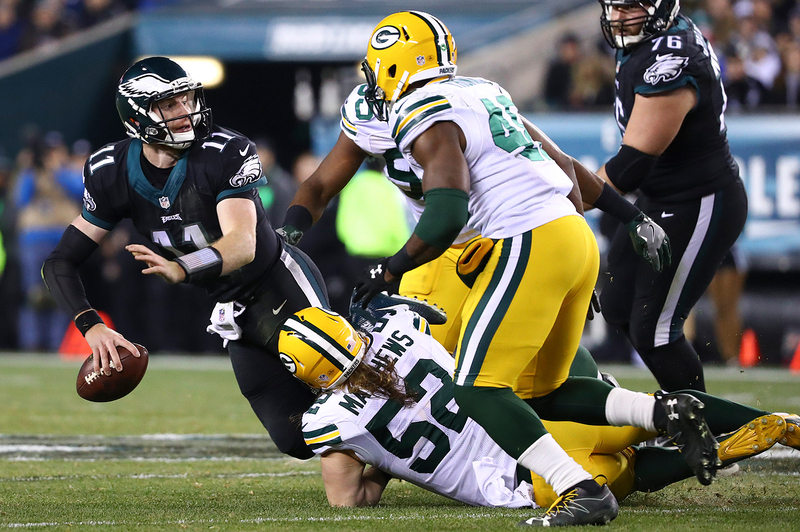 After a 3-0 start, Carson Wentz and the Eagles dropped seven of their next nine games. 1. Wentz wagon stuck in neutral. If you are reasonable, you probably knew Eagles QB Carson Wentz couldn’t maintain the torrid five-game pace he was keeping through Columbus Day. But this thing, statistically, has gone the other way altogether. After Week 5, Wentz’s passer rating was sixth in the NFL, at 103.5, and he’d thrown seven touchdown passes against a single interception. Over the eight weeks since, he ranks 29th and last among qualifying quarterbacks, with a 70.5 rating, having thrown five touchdown passes against 10 picks, and taken 19 sacks. What gives? Defensive coordinators have tape on him. They know how the Eagles made him comfortable early. And that’s helped them make him uncomfortable now. Defenses are sitting on the short stuff, pinning him in the pocket and forcing him to go deeper into his progressions. That has affected his accuracy, and more specifically revealed Wentz’s tendency to miss receivers high. Here are the three main reasons why: 1) The Eagles did things early to get Wentz going (namely getting him on the move and getting him easy completions) that they knew other teams would eventually take away; 2) the Lane Johnson suspension was looming, and it has made a huge difference up front; and 3) the Eagles knew they need another playmaker to help Wentz, and they plan to get him one in 2017. So that, at least in part, explains why he’s trailing the likes of Case Keenum, Brock Osweiler and Blake Bortles in passer rating over the past eight weeks. But going through it has been valuable, and it’s not like he hasn’t gotten better. According to the guys working with him, the rookie has improved his base and his stride mechanically, and is showing an increasing willingness to check the ball down when his reads aren’t there. It just takes time, which the Eagles will, of course, give him. And the expectation is that they’ll get a little more out of him at home this week against Washington. 2. Gronkowski’s absence bound to make a difference, but Ravens aren’t counting on it. There’s very little question that, at least by the numbers, Rob Gronkowski’s absence has had a profound impact on the Patriots in general, and Tom Brady in particular. Since Gronk came into the league, the team is 69-17 (.802) with him in the lineup and 14-5 (.737) without him, in the regular season. And Brady has completed 65.5 percent of this throws for 25,002 yards, 193 touchdowns, 39 picks, and a 104.9 rating in the 86 games with him, and 58.4 percent of his passes for 4,383 yards, 28 touchdowns, 14 interceptions in the 19 games without him. Also, it’s no coincidence that the one season of the last six during which Gronkowski stayed healthy through the stretch drive and playoffs happened to be the Patriots’ 2014 championship campaign. This will be the third time in five years he’s finished the season on the shelf. On top of that, his knee injury last year was one factor in the Patriots losing the top AFC seed and having to go to Denver for the AFC title game, and he played on a high ankle sprain in Super Bowl XLVI. All that should illustrate this: The Patriots aren’t better off now than they were a week ago. But they may be better equipped on offense to deal with the loss of Gronk than they have been in past years. For one, the offensive line and running game is stronger than it has been; they’re sixth in rush offense after finishing 30th there last year. For two, they have more receiver depth with Chris Hogan and Malcolm Mitchell in the fold. And for three, Martellus Bennett is probably the best simulation of Gronk that they’ve had in reserve. So excuse the Ravens if they’re not expecting much of a dropoff when they get to Gillette Stadium on Monday night. One Baltimore coach texted this: “As long as 12 Is there, it doesn’t matter who else is, just being honest.” And another Ravens official said, “It’s a unique team, it’s not a team that can’t afford to lose a guy. They change their personnel every week anyway. It’s a matchup team, there’s no pattern to what they do. … And as much as anything, it’s the guy at the helm [Brady] and how he elevates everyone else.” Even taking that into account, the Ravens’ top-ranked defense this week, and the Broncos’ decorated group next week, should give everyone a good accounting of where the Gronkless Pats are. 3. Giant test for New York’s defense. There’s no questioning the Giants’ defensive improvement this season. They rank 17th in total defense (356.8 yards/game) and eighth in scoring defense (19.8 points/game), after finishing 2015 ranked dead last (420.3 yards/game) and 30th (27.6 points/game) in those respective categories. But this week’s challenge is unquestionably different. After facing the Rams, Eagles, Bengals, Bears and Bengals in successive weeks, and winning all those games, New York is now coming off a loss in Pittsburgh, and gets an elite opponent in Dallas. And workhorse defensive end Jason Pierre-Paul is down. So what does it mean? As much as anything, the Giants need their well-paid free-agent class to come up bigger than it has all year, and Janoris Jenkins, Damon Harrison and Olivier Vernon have already set that bar awfully high. That, to me, is fascinating: a big, quick-fix, free-agent splash actually worked! Those three represent the tangible difference in coordinator Steve Spagnuolo’s second year back at the Meadowlands and have been worth all of the more than $100 million guaranteed that they were given in March. Talking to people in the building, the reason why is simple: The Giants were concerned as much about who those three were as people as what they were as players. Secondary coach Tim Walton had Jenkins in St. Louis, and raved to the front office about his competitiveness. Since Harrison was a short trip down the road with the Jets, the Giants were able to ascertain that he had a presence about him and a deep love for football, and all that was confirmed when they took him to dinner. And they’d heard enough about the stoic Vernon’s professional, stoic demeanor to know he’d be a fit. In short, the Giants felt, based on their intel, they were signing guys who’d be satisfied simply with the payday. As one club staffer explains, “You wouldn’t know that OV, Snacks and Jackrabbit are the high-money guys by how they carry themselves.” So here’s what they’ve gotten—a corner who can match up with receivers without help, a mudder who demands double teams in the middle, and a reliable edge player who can win the DE/TE battle every time, which is vital in Spagnuolo’s “over” defense. On top of that, Jenkins and Harrison quickly gave the defense attitude, while the quieter Vernon has slowly become a bigger and bigger presence in the makeup of the team. Suffice it to say, with Dallas up next, the Giants are going to need all of it. Anyway, I thought of all that when the Newton firestorm spiraled out of control following his single-series benching on Sunday. (He hasn’t forgotten his hat all year, right? Just get yourself a tie, dude.) And I couldn’t help but think that wouldn’t have happened to this team last year. 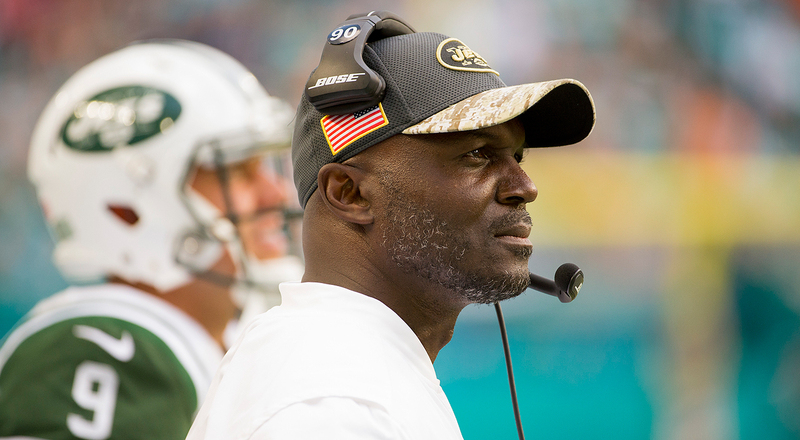 Two years into the job, Todd Bowles is already hearing the calls for him to be fired as Jets head coach. • On paper it makes no sense for the Jets to fire GM Mike Maccagnan and coach Todd Bowles. If you’ve fired two general managers since New Year’s Day of 2013, you’re acknowledging what you think of the roster. And Maccagnan and Bowles have told us what they thought of the roster in their actions since. Only 13 draft picks made by Mike Tannenbaum and John Idzik remain, and only seven of those guys started in Monday night’s disaster. Of those, three (Nick Mangold, Darrelle Revis, David Harris) were picks from almost a decade ago. Another one (Sheldon Richardson) was nearly traded. And another (Mo Wilkerson) has clearly fallen out of favor. So this always was going to take time. The question now becomes whether owner Woody Johnson can block out all the inevitable noise around the team and stay the course. • Speaking of teams showing patience, the Raiders deserve credit for giving GM Reggie McKenzie time to build the team and grow into the job. There was a time a couple years ago when whispers persisted that the former Packers personnel man wasn’t up to the job, and a feeling that he could be gone after the team whacked coach Dennis Allen. There were whispers that they tried to get now-Redskins GM Scot McCloughan, and who knows what would’ve happened if they’d landed Jim Harbaugh or Jon Gruden. I’m guessing they’ll take what actually happened, which was McKenzie keeping the job, continuing to grow into it, and building an imposing young core. Tonight the Raiders go into Arrowhead at 10-2, and McKenzie may be the leader in the clubhouse for executive of the year, with his coach, Jack Del Rio, also a candidate for postseason honors. • It will be interesting to see how the NFL and NFLPA handle mounting issues with the drug policy once we get to the offseason. In the past month alone, Eagles OT Lane Johnson has filed a complaint with the National Labor Relations Board, Packers DL Mike Pennel has filed suit against the league (he settled the case this week), and the Cowboys were under the expectation that star-crossed DE Randy Gregory would be be able to practice Wednesday, only to have the rug pulled from under them Tuesday. The common thread in all these cases is clarity, and that’s on both the league and the union. It’s a complaint that’s not new, and I’d imagine with these cases becoming so public, some tweaking should be coming. 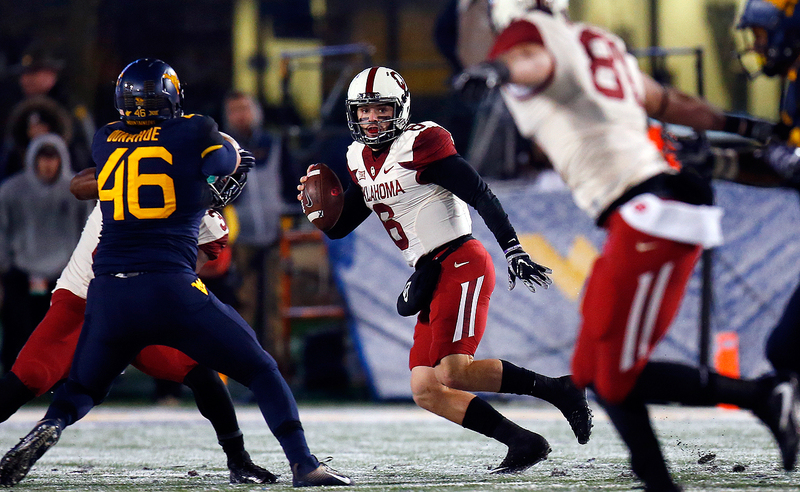 Oklahoma’s Baker Mayfield has impressed NFL scouts with his ability to extend plays. 1. Oklahoma QB Baker Mayfield (Heisman Trophy ceremony, ESPN, 8 p.m. ET): Mayfield’s back story is pretty awesome—walk-on-turned-true-freshman-starter at Texas Tech transfers to Oklahoma after that first season without telling the Sooner coaching staff, wins the starting job there after redshirting in 2014, and leads OU to back-to-back Big 12 titles. Now, on the surface, it’d seem like Mayfield is just an athletic, tough college quarterback who just isn’t much of a fit for the NFL game. The underdog finished this year with 3,669 yards and 38 touchdowns through the air, and another six touchdowns on the ground. So how does he project? Chase Daniel might be the best comp for him. “He’s got another year [of eligibility], and all signs point to him returning, but he should probably think about that,” said one area scout assigned to the Sooners. “In a weak quarterback class, he could sneak up there where you wind up saying, ‘Oh wow, I can’t believe he went there!’ Normal year, he’s a late-round guy. But he throws a nice deep ball, he’s mobile and can extend plays, he’s shifty and tough and competitive as hell. He’s impressed me. You wanna say he’s a poor man’s [Johnny] Manziel because of how he makes plays, but Johnny was a lot more talented. But Baker has developed as a passer, he’s developed his fundamentals and mechanics, and he’s an interesting one to look at.” So while Mayfield may never be an NFL starter, the traits suggest he could stick for a long time as a backup. And in a day when veteran backup quarterbacks are making more than $5 million per, it certainly could be worth it for some team to throw a draft pick at the possibility that he becomes that. 2. Clemson QB DeShaun Watson (Heisman Trophy ceremony, ESPN, 8 p.m. ET): Maybe Watson’s stock has fallen. Maybe we’re all catching up to how scouts always felt about him. Either way, at this point it seems like he’s probably third on the prospect list among draft-eligible prospects, behind North Carolina’s Mitch Trubisky and Notre Dame’s DeShone Kizer, should both underclassmen declare. And it’s not really anything Watson has done much differently, especially down the stretch of the college season. Watson completed at least 67 percent of his passes in six of the Tigers’ final seven games, and Clemson is in the playoffs as ACC champion for the second straight year. The problem? It has more to do with Watson’s style of play than anything else. “He’s a heck of college player, and he’s a great kid,” said one NFC personnel exec. “He’s thrown for a ton of yards. But for the pro game, it’s tricky with quarterback. He’s not great reading defenses, and you see him force the ball at times. And if the first read isn’t there, you see his first instinct’s to run. And you can see it, in how his eyes come down. That’ll be a problem in the league. In the pocket you have to slide and move and buy time. All the great ones have pocket presence. And we just haven’t seen it from him.” Another evaluator sees the holes in his game as being similar to those of Robert Griffin III coming out of Baylor, although the two are different in personality and how they operate as leaders. That means, even with 33 collegiate starts under his belt, Watson remains a projection as an NFL prospect. A more demonstrative Matthew Stafford has led the Lions to the top of the NFC North. It’s been a little more than 13 months since Jim Bob Cooter took over as Lions offensive coordinator. And if you give him and Matthew Stafford their first week together as a mulligan and look at the past 20 regular-season weekends, it’s fair to say that the move from Joe Lombardi to Cooter has more than worked out for Jim Caldwell’s staff. In fact, it’s pushed Stafford into the rare statistical air of Tom Brady. It started last year, with Cooter putting in a slew of one- and two-word calls designed to streamline the process for Stafford at the line, which allowed him the ability to quicken or slow the pace as he saw fit and change plays at his own discretion. 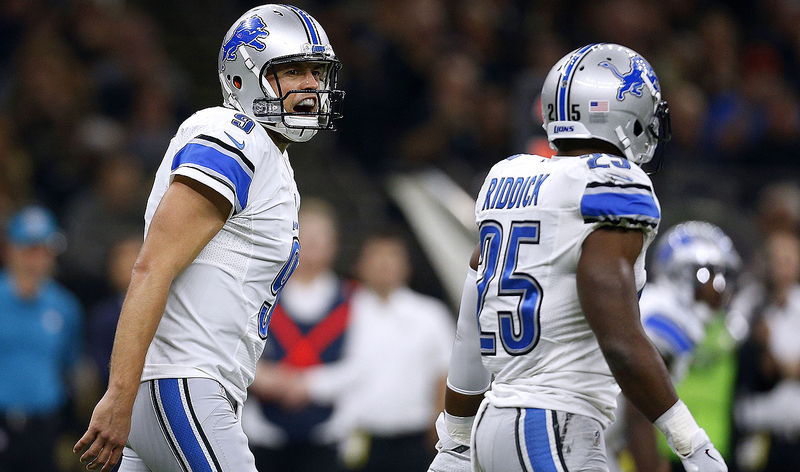 That spilled into an offseason where Stafford was visibly more vocal and demonstrative. And now it’s seen in the same kinds of Tuesday meetings Manning used to have as a player, where Stafford’s input into the game plan starts, and where the coach and quarterback have really been able sync up as a tandem. “If you don’t feel confident in how you’re pretty sure he sees it, then you may put some stuff in and say, ‘Boy, I don’t know if he’s gonna like this or not,’” Cooter says from his office. “But when you do feel good—‘Hey, listen, I’m telling you this is gonna be right down his alley, he’s gonna love this.’ And sometimes he brings ideas to the table, maybe a play or concept I haven’t been around, and we work it a couple times and I start liking it. Meanwhile, Cooter says, the sense of ownership from having given Stafford added control is evident in how the quarterback is able to direct his teammates. It might be in a yard or two difference in where a receiver breaks. It might be in how long a tight end holds his block before releasing. It might in be seeing something working just right, and Stafford reinforcing that he liked it to a back or lineman. This was the intention of the changes from the start. To be sure, there’s a very tangible difference that goes past the Brady-like numbers. Last year, Cooter says, “He may have seen a problem with a play and thought, ‘Man, that doesn’t really make sense to me.’ But he wouldn’t have spoken up.” And that can be understandable, in that it’s not in every player’s nature to push ideas on coaches. What Cooter sold Stafford on was that, eight years in, everyone would benefit from his input. The Lions clearly have. “It’s really important that the players are not out here doing exactly what we say, and being robots. It’s their offense,” Cooter said. “At the end of the day, the coaches are standing over there on the sideline and the 11 players that are on the field are out there making things happen. And things are gonna change. And as a result, three-quarters of the way into this season, that guy has the look of a legit MVP candidate.